4.8/5 out of 333 votes. People with the vibration of the Life Path 7 by their nature are deep thinkers and introverts. You look into everything, trying to get the clear causes of things. You do not accept anything without a prove, and you will always form your own - and long lasting - opinion on the subject. When the seed of thought goes into your subconscious, you will bear it for long, as long as the mind does not sparkle with all the colors of an image, now thoroughly understood by you. And only then you will begin to act, or - in the opposite - will decide to refuse from any reaction. This is your way to the attainment of the great philosophical truths, which you will use in future, comforting the suffering people and helping them. You have the gift of an extrasensory perception, you are often visited by the feeling of deja vu - the feeling that you already had a similar experience before. You will always have a role of the philosopher, teacher and healer, but it will not be easy for you to teach, if you will not overcome your self-isolation. Your habit to be reserved with the others turns to the reputation of being unapproachable. Only those who understand your inherent state of dreamy, quiet meditation are able to reach you. The lucky ones! After all, you can bestow so many upon them! Interests of persons with life path 7 primarily are: culture, history and philosophy. Everything that adorns life - you need more than the air. You are able to enjoy a beautiful painting or a sculpture, a book of talented writer. Without such a pleasure you can not keep going with your life. You are a rare connoisseur of the artist's skill, and you can admire every single stroke on the canvas, not only enjoy the general impression from the picture. Peoples with numerology life path 7 are a great connoisseur of art. You are going to be an incomparable parent, because you are able to instill in your children the ability to love life in all it's manifestations. Your majestic appearance is just the right one for your noble manners. Everyone is showing respect to you, and you take it as something, that you truly deserve. Life is often frustrating peoples with life path 7. You will meet many obstacles on your path, but your philosophical mind will help you to understand that life itself is an overcome. And only if you will try and do your best to cope with your problems, the burden of life will become a little easier for you. In this case, you will use the opportunity to delve into the mysteries of life and apply the obtained knowledge for the self-improvement. This knowledge, of a spiritual and practical nature - is your way to find happiness. Personalities with life path 7 are never in a hurry always find time for some rest and reflection. You do not have to worry about the issues of economic nature, because you have, in general, everything you need. 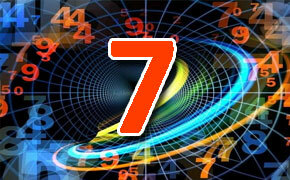 Life Path Number 7 is the number of mysticism, which has to be learned. Questions have to be asked, to penetrate the mysteries of the soul and open them to the uninitiated. And as for the material needs of a mystic - the Providence will take a good care of those. Your gift is rare and it should not be spent for nothing. Your weaknesses - a tendency for gloom, alienation, secrecy - do not contribute to good rumors about you. If many people have the impression that you are an emotionally cold person, then of course it is difficult for you to start a friendly relationship. You are also characterized by cunning and prudence in the worst of your times. Natural vocations and careers for life path 7 are: scientific authority, archeologist, authority on antiques, psychoanalyst, surgeon, historian, marine biologist and any other work related to the sea, like sailor or deep sea explorer, theologian, clergyman, authority on etiquette, psychiatrist, scientific researcher, detective, investment counselor, judge.